John Bailey is a professional knife thrower I met in Solingen, Germany. He was visiting the factory where two throwing knives that he designed (the Tan-Kri and the Starlight), are manufactured. And on this occasion, he taught me his throwing technique which I think is very easy to learn, efficient and elegant. This page ist a summary of the instructions in our throwing HowTo. It recapitulates the throwing instructions, only this time in the light of a special throwing style. After reading this page, you can have a look at the picture sequence of John throwing a knife. Hold the knife like you would a hammer, just put your thumb onto the narrow side of the knife (see picture). This is called a modified hammer grip. Now pull the knife out of your hand, until only your little finger still touches it. This facilitates the release and such stabilizes the flight. If the knife is not sharp, you can try this grip as a blade grip. Be sure to let the tip extend at least 1cm out of your palm, or else it could hurt you. For his very sharp Tan-Kris, John uses a special blade grip: the thumb is on one, the four remaining fingers on the other flat side of the blade, the knife is clamped tightly between them. The little finger gives support to the tip, the other three are a little apart. You will need strong fingers for this to work, though! Your right foot is the back one. In front of it, scratch your distance mark into the ground or mark it with a stone. Your left foot is in front, the gap between them is about two feet (your actual foot, not the measure). The heels are nearly on a line. Your two feet form a 45° angle (left 12 o`clock, right 13:30 o`clock position) or wider. Both knees are bent, especially the front one. The weight rests primarily on the ball of your back foot (behind your toes). Both arms point to the target. Keep them lax and loose! The hands lightly touch each other. John has developed an exercise that will teach your muscles the right movement sequence: Imagine you are standing in basic stance, your right knee touches a low garden fence. On the other side of the fence there is the branch of a tree that you want to chop off with your knife. Unfortunately, the branch is far on the other side, so you have to stretch to reach it. Now wind up the arm with your knife and try to chop the branch (see picture below). It would be best if you had a real stick that you try to chop (perhaps really a branch, held by a friend). 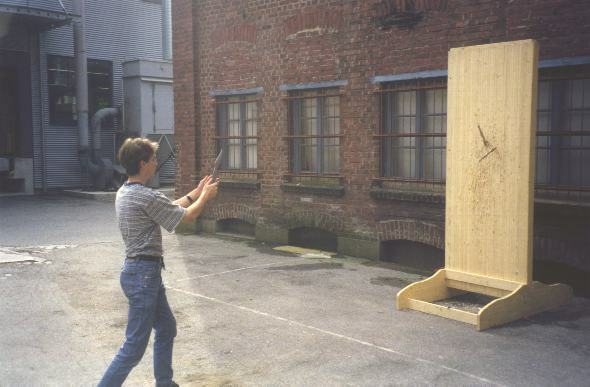 After you did this for some time, take away the stick, make the swing and just let go the knife as it points exactly to the target. That`s it! Just to have it really all on one page, here are the instructions for the whole movement, starting from basic stance: The right hand with the knife goes back with a natural movement, until the elbow is on a level with the shoulder (in the picture below, the elbow is not high enough!). The blade points to the sky, the hand is a little behind your back. 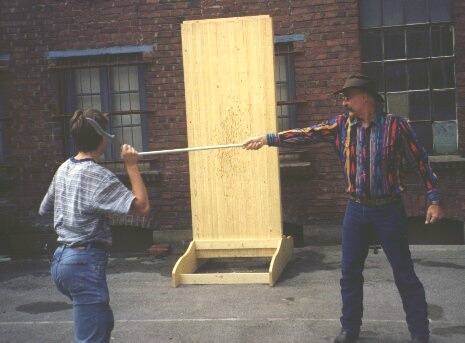 Now you can begin the smooth movement: The hand swings towards the target, arm and shoulder do extend (the branch is far away). The knife glides out of your hand as it points exactly to your target point. Do continue the forward movement; It is called the follow through . You can see the whole motion in a special picture sequence. To get a right-angled stick (or at least some stick), read the training-section of this manual. Please change the distance to the target only in steps of at most 10cm! Don`t forget to update your distance mark accordingly. John Bailey has published an instructional video where, among other things, he explains this method. You can buy the video here at knifethrowing.info. John holds the stick behind the imaginary fence that I shall try to chop. My right elbow should be higher!